When you sponsor a Birthday Celebration in the Classroom, the gift you give one child puts a smile on the faces of twenty more. 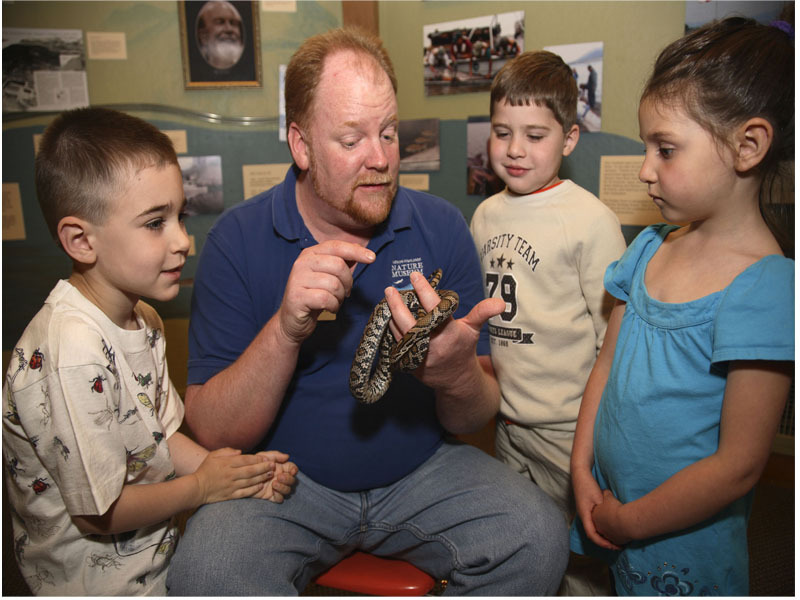 With your child acting as assistant, a Museum Educator presents a fun, science and nature-based program - many featuring live animals - for the whole class to enjoy. 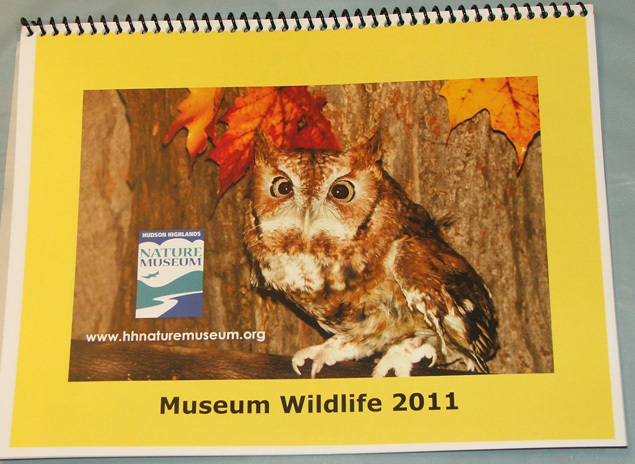 Talk to your child's teacher then choose from a list of options tailored to work with the curriculum for Kindergarten through Grade 5, including Into to Animals, Habitats of the Hudson orInsects and their Allies. Your child receives a Museum t-shirt; classmates get a free pass to the Wildlife Edcuation Center. Click here for details. The Museum has so much more to give! please call 845-534-5506, ext. 204. Skaters enjoy a chilly session at the Bryant Park Citi Pond rink in the middle of Manhattan. Cold weather may be keeping everyone indoors, but parents needn't worry about little ones climbing the walls. It's the most wonderful time of the year for family events around town, indoors and out — from the Queens Farm Museum decking its halls to Charles Dickens' "A Christmas Carol" presented in the Bronx. And the greatest gift of all? None of these costs a thing. The Citi Pond rink is free when guests bring their own skates. Skip the Rockefeller and Central Park crowds (and their tourist-driven steep sticker prices) and take a spin on the ice during the park's extended holiday hours. Daily, 8 a.m.-midnight, 40th St. between Fifth and Sixth Aves., thepondatbryantpark.com. This small-town celebration takes place in one of Queens' most bustling neighborhoods. Catch the lighting ceremony at the post office, with caroling and free hot cocoa and sweet treats afterward. Dec. 15, 5 p.m., 78-02 37th Ave. at 78th St., Queens. (718) 565-5344. The Brooklyn park boasts free arts and crafts in the Lefferts Historic House, an educational Science Power Hour in the Audubon Center, plus bird tours and 585 acres of open space for running around, not to mention free New Year's Eve fireworks. Audubon Center, Sat. & Sun., noon-4 p.m. Lefferts Historic House, Sat. & Sun., noon-5 p.m. 450 Flatbush Ave., Brooklyn. Visit prospectpark.org. See the spruce spring to life today at Greenbelt Recreation Center. Carolers from the center's after-school program sing and serve light refreshments. 4 p.m., 501 Brielle Ave. at Rockland Ave., Staten Island, (718) 667-3545. Flushing Meadows-Corona Park becomes a carnival next weekend with four hours of inflatable rides, games, live music, arts and crafts and refreshments at the year-old Al Oerter Recreation Center. Dec. 17, 4-8 p.m., 13140 Fowler Ave. at Van Wyck Expressway, Queens, (718) 353-7853. Join Phil Kline's annual Unsilent Night parade from Washington Square to Tompkins Square Park on Dec. 18. A limited number of boom boxes will be handed out for marchers to hold overhead as they bop across town. Past parades saw iPods and even laptops hooked to portable speakers and mounted on wagons. Dec. 18, 6:45 p.m., the Arch at Waverly Place and Fifth Ave. Visit unsilentnight.com. Come to Crumbs Bake Shop's newest upper West Side location on Saturday, where they’ll be handing out 1,000 free cupcakes in a grand opening giveaway. Sat., 8 a.m., 775 Columbus Ave. at 97th St. Visit crumbs.com. Santa gets in on the action with some afternoon skating at the Rockefeller Center rink. The Traveling Lantern Theatre Company stages free performances of "A Christmas Carol" in New York Public Library branches across the boroughs all month, including a show tomorrow in the Bronx Westchester Square Library. Fri., 4 p.m., 2521 Glebe Ave., at St. Peter's Ave., the Bronx. Travelinglantern.com. Little ones can release their restless energy in three-legged races, an ice cube hunt, team flying-disk golf and sack hops during Fort Greene Park's Winter Games this weekend. Parents can play along to make up for all those holiday cookies. Meet at the Visitor Center. Sat., 1 p.m., Washington Park at Willoughby Ave., Brooklyn, (718) 722-3218. The Queens County Farm Museum decks its 17th-century farmhouse with festive holiday wreaths, stockings and an old-fashioned tree, and it's all on display the three days afterChristmas. So families looking to make the holidays last a little longer can enjoy free tours, craft activities and mulled cider. Dec. 26-28, noon-4 p.m., 73-50 Little Neck Parkway at 74th Ave., Queens, (718) 347-3276. Harlem's Schomburg Center for Research in Black Culture hosts a holiday open house featuring live Afro-Caribbean music, storytelling and craft-making workshops for kids, plus a screening of the Maya Angelou-narrated "The Black Candle," the first feature film aboutKwanzaa. Dec. 18, 515 Malcolm X Blvd., at 136th St., (212) 491-2229. Holiday carols aren't just about jingling bells and little drummer boys. Rockefeller Center hosts its 37th Merry Tuba Christmas concert at the skating rink, conducted by Chris Wilhjelm, former conductor of the Goldman Memorial Band. Sun., 3:30 p.m., 30 Rockefeller Plaza, between 49th and 50th Sts., (212) 632-3975. Enjoy a little night music. Candles light Van Cortlandt Lake for a winter solstice celebration, complete with dancing by Jody Kruskal's classical concertina, before rangers lead families on a moonlight walk of the old Putnam railroad tracks. Hot refreshments will be served to warm little bellies. Dec. 19, 5 p.m., Van Cortlandt Park, Bailey Ave. at Van Cortlandt Park South, the Bronx. (718) 430-1890. Chinatown and Little Italy unite in a colorful procession with floats, lion and dragon dancers, marching bands and an appearance by Santa Claus, from Canal St. to Chatham Square. Dec. 18, 2 p.m., Canal and Mulberry Sts., (212) 302-0551. The Bear Mountain Holiday Events take place at the Overlook Lodge, a newly renovated building that is designed to reflect the rustic beauty of the area with a touch of elegance. For more information on these events or to register, please call (845) 786-2731. Start the holiday season at Bear Mountain as our elves lead the kids in special activities, crafts, a holiday dinner, and a visit from Santa. Surprise your child with a special gift from Santa. $14.95 per Child; $16.95 per adult. For reservations please call (845)786-2731. Create your own gingerbread house masterpiece; enjoy a snack and refreshments while you work. Bear Mountain will supply the gingerbread houses and all the sweet and colorful trimmings. $10.95 per Child | $16.95 per Adult | $25 per house. For reservations please call (845)786-2731. Say farewell to 2010 and ring in 2011 with us as we pull out all the corks for our New Year’s Eve Bash at Bear Mountain. The Bash includes a reception, dinner, open bar, entertainment and party favors, as well as the midnight champagne toast. New Year’s Eve Bash: $139* (plus tax) per couple. New Year’s Eve Package (includes lodging and New Year’s Day Brunch): $299* per couple plus tax. For information, please call (845) 786-2731. Start the New Year off right with our special brunch offering an array of chilled salads, smoked salmon, made-to-order omelets, lavish desserts, and much more. Complimentary champagne, Mimosa, or Bloody Mary. $32.95 per person | $15.95 Children (ages 6-12) | Ages 5 and under free. To researve, please call: (845) 786-2731. Guest Services, Inc. (GSI), a private hospitality company dedicated to excellence in food, hotel, resort, and recreation services is the management company for the Bear Mountain Inn & Conference Center. A Christmas tree is illuminated at the 85th annual New York Stock Exchange. Move over, Paris. With dazzling displays from Staten Island to Queens, the Big Apple is the next city of lights. Tonight, chef Marcus Samuelsson flips the switch for Harlem's first-ever river-to-river holiday lights, and the New York Stock Exchange and Brooklyn Borough Hall are both turning on their Christmas trees with gala events and guest stars to boot. 5:30 p.m. is at nyse.com. Free, Broad St., between Exchange Place and Wall St., (212) 656-3000 or nyse.com. The Holiday Train Show is back with detailed, scaled miniatures of local landmarks like the Statue of Liberty and the Brooklyn Bridge carved entirely out of plants, bark and seeds, set against twinkling holiday lights. $20, Kazimiroff Blvd. at Fordham Road, the Bronx, (718) 817-8700 or nybg.org. At Harlem's first Christmas tree-lighting ceremony in the new West Harlem Piers Park tonight, Marcus Samuelsson (whose Red Rooster restaurant opens in the area later this month) does the honors at 5:30. Then, at 6:30 at the Adam Clayton Powell Office Building (163 W. 125 St.), the 125th St. corridor gets lighted from the Hudson to the East River for the first time. Free, 132nd St. at the Hudson River, (212) 864-6200. Marty Markowitz hosts the multi-cultural lighting ceremony today at 5:30 p.m. in downtown Brooklyn, where a 40-foot holiday tree is the centerpiece to a hip-hop interpretation of "The Nutcracker" by the Brooklyn Ballet. Free, 209 Joralemon St. at Court St., Brooklyn, visitbrooklyn.org. Flushing's new Sky View Center puts on hourly light shows every Thursday, with moving colors and spinning snowflakes synchronized to music on the walls of the mall's lobby daily. Plus: free concerts and performances by the Big Apple Circus on Saturdays through December. Free, 40-24 College Point Blvd., shopskyview center.com. Bryant Park's skating pond is free when guests bring their own skates. Citi Pond hosts free events daily, like daily juggling lessons from noon to 1 p.m. (weather permitting), and seasonal holiday shops ring the rink. The park's 50-foot glittering holiday tree is decked with 3,000 ornaments. Free, 40th St., between Fifth and Sixth Aves., thepondatbryant park.com. Staten Island's botanical garden twinkles with a holiday tree outside the Carl Grillo Glass House, which also includes a display of part of the Health and Hospitals Corp.'s art collection in the C Hall, with works by Andy Warhol and Will Barnett — through this weekend. $5 adults, free for kids under 12, 1000 Richmond Terrace, (718) 448-2500 or snug-harbor.org. Twelve 14-foot stars hang from the ceiling of the Columbus Circle shopping center's 150-foot Great Room in a colorful display choreographed to music nightly from 5 p.m. to midnight. Free, 10 Columbus Circle at 59th St., (212) 823-6300. The historic nabe goes all out for the holidays with lights strung along Mulberry St. and restaurants decking their doors and windows. The East Meets West Christmas Parade on Dec. 18 celebrates Italian and Chinese residents by combining the food from both cultures. The Little Italy Merchants Association also presents two live musical Nativities this Saturday at 6:30 and 8 p.m., at Most Precious Blood Church (with petting zoo). Free, Mulberry St. at Canal St., (212) 302-0551 orlittleitalyguide.com. The Wildlife Conservation Society's festive holiday lights and greenery deck the pathways between the zoo's habitats. Saturdays in December (through Christmas), the park is open until 6:30 p.m. for special shows like polar-themed performances at the Wildlife Theater and live animal encounters in the Zoo Gallery. Plus, the snow leopards, polar bears and penguins get Christmas treats (like fishicles and fruit) daily. $12 adults, $7 kids ages 3 to 12, Fifth Ave. and 64th St., (212) 439-6500 or centralparkzoo.com. Of all the city's holiday trees, the Village's annual spruce in Washington Square Park boasts one of the most picturesque locations — right beneath the iconic arch. The tree lights up tonight at 6 as singer Mary Hurlburt and the Rob Susman Brass Quartet play classic holiday carols (the Washington Square Association hands out free songbooks so guests can sing along). Santa will stop by to lead the countdown. Free, Washington Square North at Fifth Ave., (212) 252-3621 orwashingtonsquarenyc.org. Last week's gale-force winds briefly toppled the 55-foot Norway spruce, but the holiday tree, lighted by 10,000 eco-friendly bulbs, is again upright. Free, Fulton St. at South St., (212) 732-7678 or southstreetseaport.com. This year's jaw-dropping spruce stands 74 feet tall and features 30,000 multi-colored LED lights on 5 miles of wire, plus the 9½-foot Swarovski star on top that glitters with 25,000 crystals. Free, 30 Rockefeller Plaza, between 49th and 50th Sts., (212) 632-3975 or rockefellercenter.com. The Winter Garden turns into a life-size snow globe with 100,000 holiday lights. Special guests including the Big Apple Chorus and the Niall O'Leary Irish Dance Troupe, performing through the month. Santa Claus will stop by this Saturday and Sunday, 10 a.m.-1 p.m. and 2-7 p.m. Free, 200 Vesey St., artsworldfinancialcenter.com. A tree sparkles at Joe Sabba Park (50th St. and Queens Blvd. ), and Skillman Ave. boasts illuminated snowflakes lining the block from 45th to 51st Sts. Free, Queens Blvd., between Greenpoint Ave. and 50th St., sunnysidechamber.org. For two Christmases, John and Catherine Ellison shared their home with the officers and soldiers of the Continental Army. Over the winter of 1780-81, General Henry Knox, his wife Lucy and the young Henry and Lucy were there, while two years later it was General Horatio Gates and his military family of aides de camp who shared in the season’s festivities. From 6:00 to 8:00 PM on December 18th tour the elegantly appointed 1754 Ellison house decorated for Christmas and staffed by Revolutionary War era costumed interpreters. For your further enjoyment, the King’s Delight will play period music throughout the evening. On Monday December 27th, Tuesday December 28th & Wednesday December 29th there will be an Open House at Knox’s Headquarters. The Ellison home will be open for tours at 10:00 AM, 11:00 AM, 1:00 PM & 2:00 PM each day. 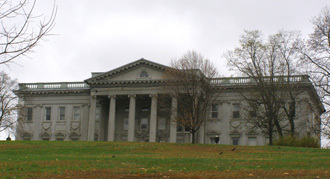 Knox’s Headquarters is located at 289 Forge Hill Road in Vails Gate, at the corner of Route 94 and Forge Hill Road, just three miles south of the intersection of I-87 and I-84. Please Join Riverside Park Fund and NYC Parks & Recreation in coordination with the 125th Street Business Improvement District and Community Boards 9, 10 & 11 for Holiday on the Hudson, the first annual Tree Lighting at West Harlem Piers Park. The tree lighting kicks off "Harlem Holiday Lights" along 125th Street which will continue throughout the evening. Enjoy refreshments and musical entertainment by representatives of the Ebony Ecumenical Ensemble. Refreshments and entertainment generously underwritten by Fairway Market.